The Sparmax Beetle kit is perfect for beginners through to professional airbrush users and is suitable for a wide range of applications. 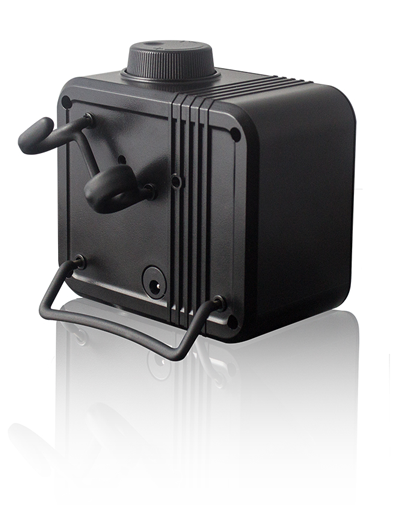 With its simple and sleek appearance, the Sparmax Beetle compressor is compact and light, yet powerful for its size. The unit is pressure adjustable and incorporates the latest user-friendly feature: the Patented Smart-Stop (see details below). The Beetle's compact size makes it ideal for those who require to be mobile or have space limitations. 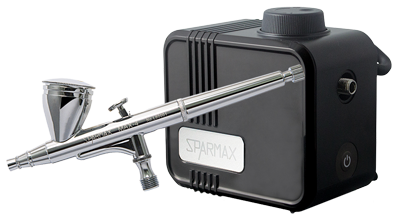 The Sparmax MAX-4 airbrush included in this kit provides exceptional performance with even the smallest compressors because it atomises well at low pressures. It has a 0.4mm needle and nozzle combination for general purpose, high paint flow spraying and wider spray patterns. The 0.4mm nozzle is ideal when spraying thicker or heavier paints whilst still obtaining a fine level of detail. The Smart-Stop function of the Beetle is compatible with most airbrushes in the market. In exceptional cases of incompatibility with Smart-Stop, it can still be operated manually via the power switch, offering a compressor that is compact, quiet and powerful. The Smart-Stop operates by detecting the presence of an airbrush in the airbrush holder. 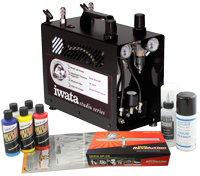 It pauses the compressor when the airbrush is placed into its holder and restarts it when it is taken off again. Pistol trigger & bottom fed airbrushes may not be compatible due to the trigger or bottle preventing engagement in the airbrush holder. Air flow: 14 lpm (0.49 cfm) at open flow, 6 lpm (0.21 cfm) 10 psi. 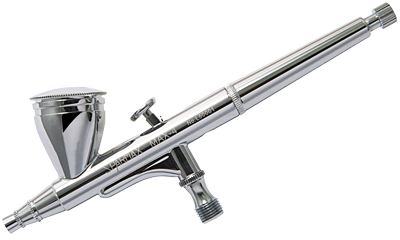 The Beetle is compatible with a wide range of gravity feed airbrushes in the market. For more information or advice on this, please contact us.